As always, I had a fabulous Birthday this year. 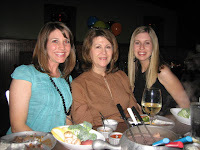 The celebrations started with a delectable dinner at The Melting Pot with Bobbie, Farron, Mark and Holly. Tell me. What can really beat fondue? Unfortunately my camera died on me so I can only upload one pic. Luckily it was a good one! Throughout the week I received calls, cards, gifts, and flowers from all my friends and family. (I am especially set for lots of trips to La Madeleine!!!) It was so fun checking the mail each day. 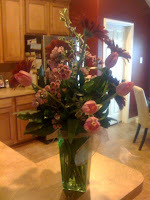 Here's a pic of a bouquet of flowers I received from Mom & Lonnie. They are just so pretty that I have to share them with you. I'm off to buy all kinds of goodies with my gift cards. :) Thank you all!